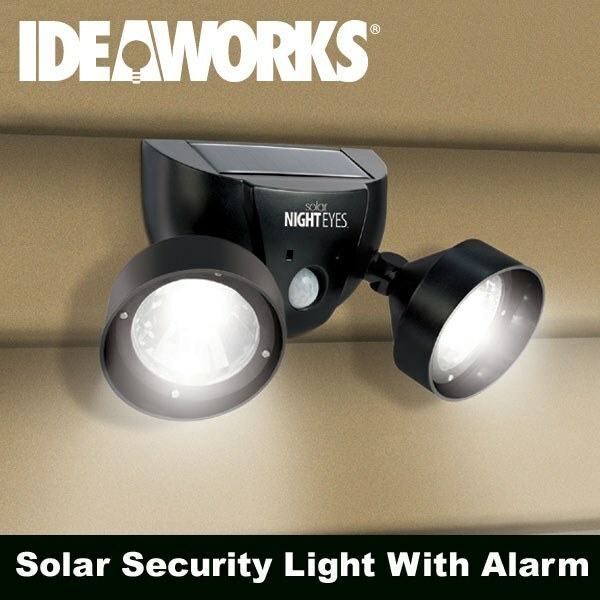 Keep your home and family safer with Night Eyes Security Lights the cordless, dual motion-activated security lights with alarm. Alarm can be turned off so only light is activated providing light when needed. Automatically turns ON when motion is detected. Alarm will alert you to visitors wanted or unwanted! Built in sensor detects motion up to 10&apos; away and turns on spotlights for approximately 60 seconds. Lights rotate for maximum coverage. Remote control activates and deactivates 70dB alarm. Super bright LED bulbs stay bright for hours. Ideal for doorways, paths and yards for safety and security. Weather resistant, designed for outdoor use. Easy to install with included mounting hardware. Light includes solar-rechargeable battery; remote includes button-cell battery. Dimensions: 6" x 4.25" x 2.5" base with 3.5" dia. spotlights.